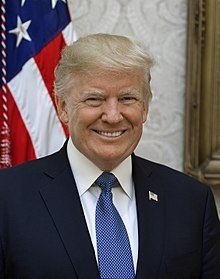 Happy birthday anniversary to our President! Love him or hate him. Your choice and a real commentary on you. I tweeted nearly 3200 times in an effort to educate the public on this controversial man in an effort to get him elected. You see, I do not like to think a miracle would be America's only hope. Miracles never saved any nation which crumbled under the weight of its own corruption. Larry, the cable guy, standup comedian said it best: "Give the man a chance; he had everything to lose". I purposely do not fall for alleged references to Donald Trump in the Old Covenant Scriptures. At the same time I admit ignorance. One thing I do believe: God blessed us with this man. He gave us one more chance to extend for some unknown time what our National Forefathers stood for...freedom to live in a "land of opportunity". I have numerous reasons to believe that God blessed us at such a critical time. In 1959 a spiritual mentor of mine (link on "Coming Soon! page, "unity-in-diversity...) had written an article entitled, "Sunset in the West", in which he, along with other brillian minds agreed that America was following the same path as was Rome before its destruction. History does repeat itself whether we know it or not. I began early in 2016 concentrating on getting Trump elected as I saw him as our "Sunrise in the East". An illustrative image can be viewed (on the above mentioned page) on this site someone had posted under the caption, "A New Day for America" that illustrated my vision. No person outside of God's Begotten was ever perfect. Wisdom of the ages points to one earthly answer in the affairs of humans in our "One Nation Under God". We are truly blessed with blessings even though some think Trump was "rammed down our throats". Remember that Jesus came down from heaven to save the world. Trump stepped down from an opulent lifestyle to save the Nation. He already had wealth, fame and a well-loved busy life. No one stepped up to the plate to take on the insurmountable task of cleaning up Washington. Trump is rare and a real treasure.